Washington, United States of America, Pennsylvania street with few vehicles, streets usually crowded. WASHINGTON — Out of the cold snap and into the downpour … and then back into the cold. The brief respite from the cold that came on Thursday morning will steadily give way to more cold temps throughout the afternoon and into the evening. While temperatures Thursday were considerably warmer to start than they have been in the last few days, heavy rain and winds pushed into the area along with the improved temps. Temperatures will steadily drop throughout the day before settling in the 30s overnight. Starting around 2 p.m., the mercury will begin its retreat and overnight temperatures could dip below freezing. 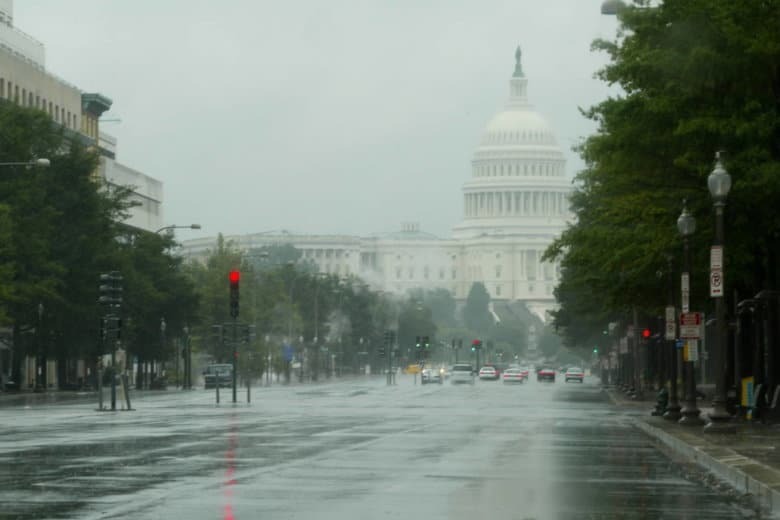 A flood watch will be in effect until 3 p.m. on Thursday in D.C., Maryland and Virginia. In Maryland, the flood watch applies to Anne Arundel, Carroll, Howard, Montgomery, Charles, Frederick, Baltimore, Prince Georges and Harford. In Virginia, the flood watch extends to Arlington, Alexandria, Loudoun, Fairfax, Fauquier, Prince William, Spotsylvania, and Stafford. Heavy rains moved in during the morning hours on Thursday, drenching the already soaked region. By the end of the day, total rainfall amounts could be around 1 inch in most places, with some isolated areas seeing as much as 2 inches. The National Weather Service said the risk for flooding is increased because the ground is frozen and already saturated. According to Storm Team4 meteorologist Chuck Bell, we had our friends to the south to thank for the blast of warmer weather this morning. A flood watch for most areas east of US-15 until 3 p.m.
THURSDAY: Rainy and windy, especially this morning. Mild this morning. Falling temperatures through the afternoon and evening. Temperatures in the upper 40s and mid 50s now, falling through the 40s and into the 30s this evening. THURSDAY NIGHT: Becoming mostly clear. Windy and cold. Some refreeze of standing water. Lows: mid 20s to low 30s. FRIDAY: Mostly cloudy. Blustery and cold. A few scattered flurries. Highs: mid 30s to near 40. SATURDAY: Partly sunny. Seasonably chilly. Highs: low 40s. SUNDAY: Mostly cloudy. Highs: mid to upper 40s.